I heard the author speak at a City Club luncheon in Chicago. She was a great speaker, and her experiences reporting on two Illinois governors' trials (yes, sometimes I'm embarrassed to be from Chicago) sounded fascinating. I bought the book recently for Kindle and read it quickly. While I read some of the news reports when they came out, and occasionally happened on the reporters on my way to court, I didn't follow the trial in detail, so I really enjoyed filling in the blanks as to the investigation of and evidence about Rod Blagojevich. Korecki did a great job explaining who the different people involved were, with just enough background so that I could keep track of who was who but not so much that it slowed the narrative. 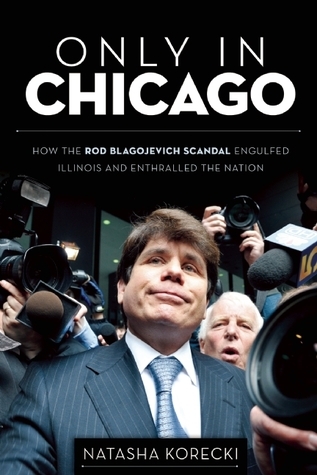 Blagojevich's character comes across clearly, including his seeming lack of touch with the reality of the charges he faced and what he'd done. I read fiction more often than non-fiction, so I was a bit disappointed in that I'd hoped for a little more of an interwoven storyline rather than what seemed more like strung together accounts as to each different person's story and each different event in the timeline. But the latter is more appropriate for this type of book, which is more fact-based reporting than creative non-fiction of the In Cold Blood variety. (And I recently heard In Cold Blood may not have been accurate in some significant respects.) I'd definitely read another book by this author. Korecki is one of Chicago's excellent unsung print journalists. Here, she unspools an account of the final days of the Blagojevich administration with great immediacy and clarity, juggling a huge cast of unsavory characters, career politicians and the occasional reformer. In the aftermath of Blago's trial, it's easy to forget some of the secondary players. This book will help illuminate some of those darkened corners. A good, engaging read with a lot of details I hadn't heard before. Such a lovable crook, that guy. The best part was when he wanted to appoint Oprah to the Senate, saying that he believed "she's like a black Einstein!"